I purchased this sweater in cappuccino. Both the style and color of this sweater are lovely! The fabric is so soft, making this sweater very comfortable to wear. I plan on purchasing more colors! 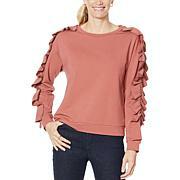 Thank you Guiliana for another great line at HSN! Im so glad you are back! Nice conservative sweater with elevated style...hits below the waist at the top of hip. Center seam detail with the sleeves make it modern and fresh! High quality, warmer than I thought. TTS-I bought the charcoal and cappuccino which are rich looking! Great price for the high quality of this sweater. Purchased my regular HSN size in gray and fits perfect. I would like to see this sweater with a boat neck or a v neck. Wonderful! Note Rayon, Poly, Acrylic, Nylon Blend! Note: HSN's description of 100% acrylic is WRONG! This sweater is wonderful. I bought the red to wear with G's Red Poppy velour pants. I got size L. I thought I should size down to M, but I relied on the Gar Meas Chart and HSN size advice & went with the Large & am very happy. I am just under 5'5", 40-34-38, short-waisted. Great fit. True to size. Stretchy. Soft. Washed nicely in washer in "delicates bag" (because of looser knit) in warm water. Air dry. G = high quality and attention to detail. I'm usually not a sweater girl, but I love this one! Love the amazing cut, the light fabrication & the fit. Most sweaters can be too hot & uncomfortable for me, so I tend to avoid them, but I'm so happy I tried this one! I wear a 2 & bought the Small. Got Cappuccino, Gray & Red. Thank you Giuliana for another great look!